More Than a Millionaire: Your Path to Wealth, Happiness, and a Purposeful Life – Starting Now! Tim Mullooly: Welcome back to Living with Money. This is Tim Mullooly. On today’s episode, I am joined by Randy Thurman. Randy is a CPA, a CFP, and is the co-president and CFO of a Fee-only firm called Retirement Investment Advisors. Randy, thanks for coming on the podcast. I appreciate you taking the time. Randy Thurman: It’s great to be here, Tim. Tim Mullooly: For our listeners out there, could you provide a brief background on yourself? And a little bit about your career and how you got to where you are today? Randy Thurman: Well, I grew up on a farm in Harrah, Oklahoma. And went to Oklahoma State University, got four degrees, including an engineering degree and a master’s degree and accounting degree. I paid my way through school. When I came out of school, I went to work for a bank. I had about $6,500 saved up and had a stockbroker call me up. Said that he had this stock that was poised to move. I’ll never forget that phrase, poised to move. Because I’m thinking it means up, Tim. But. Tim Mullooly: Right. Yeah. That’s right, he didn’t say what direction it was poised to move in. Randy Thurman: He did not. He did not. But, you know, I’m a banker. I’ve got my MBA. I said, hey, send me the financial statements and I’ll analyze them like they taught me in grad school. So, he sent them to me and I analyzed them. And, it looked pretty good. I invested half of my life savings, at the time, which took me seven years to accumulate in a stock called Kelly Johnstons, and six months later, they went bankrupt. I lost half my life savings. It doesn’t sound like a lot of money, but if it’s half of what you’ve got, it’s half of what you’ve got. Randy Thurman: He called me up. He said, “Man, I’m sorry. I’d like to make it up to you.” And I’m thinking, what a guy. He’s thinking about me, right? Randy Thurman: Got this oil well stock. They just hit an oil well in the Anadarko base and we’ve got to move fast. And it’ll be on the six o’clock news, so we’ve got to do it right now. And I’m thinking emotionally that I’ve got to make it up. So, I invest half of my other half of my life savings in this stock. I bought it at 40. And within two weeks, it went down to six. Randy Thurman: So, what it took me seven years of working a lot of very hard jobs, I lost in six months and two weeks. Randy Thurman: And, I cannot even communicate to you how painful that was. And yet is, funny thing about life, Tim, that it was probably the best thing that could ever happen to me. Randy Thurman: Because at that point in time, I knew I’d been struggling, trying to find what I wanted to do with my life. And, I knew right then, what I wanted to do the rest of my life. And that was to be a financial advisor. So, I went back and took some classes. I took a CPA exam, passed it on the first shot. Did the CFP thing. Went to work for American Express for a couple of years. Then went out of my own. And, that’s when I did the Fee-only financial advising. Today, we manage over $700 million. So, it worked out okay. Tim Mullooly: You know, some of those tough lessons allow you to bounce back even stronger. So, you said, that your firm now is Fee-only. Our firm here, as well, is also Fee-only. Is there a certain reason why your firm chose to also take the Fee-only approach? Randy Thurman: Yeah. But that way, you know the longer we keep our clients happy, and the better we do, the more we get compensated. So, it’s a win-win. And, we’re all about long term relationships. I think that fosters long term relationships. It removes a lot of the conflicts of interest that are in this industry. Tim Mullooly: Yeah, I agree. You’re sitting on the same side of the table because your fees, that firm gets are tied to, pretty much, how the assets do. So, you have a mutual interest to want to do well and make more money. You had a book that was recently published, February, of this year. It’s called More Than a Millionaire. What made you want to sit down and write this book? Randy Thurman: Well, I wanted to make a difference in people’s lives that really goes beyond my lifetime. That’s, kind of, an evergreen book. That when I’m gone from this earth, that people can pick up and it can help. And, kind of, have a little bit of a legacy. And that’s what the book was really written for. It’s really not our, what we’d say our target market or our niche, but I think it can help, tremendously, people make a positive difference in their lives. Tim Mullooly: When I was reading about the book, I read a review of the book. And the writer said that the best part about this book, is that everything seems attainable. When you’re talking about building a wealth of over a million dollars, some people might think that that might not be attainable for them. What would you say to people who think that they could never get a million dollars? And, if they read this book, do you think you could change their mind on how they might be able to do that? And, this book talks about if you start early and just start saving $25 a month, but start. Do something. It’s that inertia of breaking that rock for you right in front. And then, every time you get a raise, put half of it in there. Continue to invest properly and have discipline. Then, you can become a millionaire. But, the book’s a little bit more about, not just the financial stuff too, as you probably surmised. It’s about, also, balance in your life. Happiness. Giving back. Giving back time, talent, and treasure. Tim Mullooly: Because, as the title alludes to, there’s more than just being a millionaire. You know, what does the investing and the financial part of the book, how would that allow people to become more than a millionaire? What would you say is more than just getting a million dollars? The different things that people could do with it? Or, you know, to try and be happier? Randy Thurman: You know, it’s all of that. It’s the whole thing. It’s about having a process. Having a philosophy that allows you to be happier. But also allows you to make a difference in other people’s lives. And, do the things that you can do to help people. Some people, they don’t like this saying, but I sometimes say, “If you want to help the poor, one of the best ways is to not be one of them.” Because you can do a lot more helping the poor, when you’re not poor yourself. And doing things for those. The book is geared, also, that sometimes, a lot of times, I would say, it’s hard to be wealthy, if all you’re doing is hoarding the money. You’re not spreading it around and helping others. A lot of the happiness in my studies, in my 30 years of doing this, comes from helping others, also. Being financially independent gives you choices and options and that’s a great and wonderful thing, but also helping others is even more wonderful. I mean, we all know some people who are wealthy, that they’ve done so by stepping on other people and things like that. What an awful life. I think. So, there’s more to it than just the money side. Tim Mullooly: You break down the book into four different sections. Do you want to, briefly, touch on what the four different sections are and something that people could take away from each section, without giving too much away from the book? Randy Thurman: Sure. I do have it in four sections. And there’s a very technical reason why I have it in four sections. Yeah, my editor told me to do it that way. So, that’s … I have a great editor. Just a little sidebar on my editor, I had a writing coach and asked him for an editor that didn’t know anything about financial planning and investing, so I could write a book that’s easy to read. Right? Tim Mullooly: I feel like that’s a smart decision to make though because, like you’re saying, you want a book that’s easy to read. And, a lot of times, financial investing related books, for an everyday person, is not typically easy to read. Randy Thurman: And she tells me I write in jargon. Can you believe that? I write in jargon. Randy Thurman: Things like a mutual fund, so, things like that. There are so many misconceptions regarding that. And, money is just pieces of paper, green ink with seal notables on it. You know, it’s morally neutral. It’s what you do with it. We talk about that, is it for you? And talk about those concepts to see if someone wants to become financially independent. Now, that’s not necessarily the goal or appropriate for everyone. But, I think it’s for most people. Then, part two is just getting started, the essential steps. We talk about budgeting and a spending plan. And how much you should spend in different areas. There’s not a lot of budgeting books that have percentage guidelines for certain areas, and this does. It talks about how much maximum can you spend on a house. Part three is just traveling down the road, the path and the vehicles. Talks about the investments and diversification, dollar cost averaging. We talk about tax strategies. So, there is certainly a lot in there. And then, part four is just making it happen. Setting goals and achieving them. I even have a chapter on here on how to attract a raise. My millennial friends thinks it’s hilarious. But, things like showing up on time. And working while you’re there. Get off your phone. Be enthusiastic. Be polite. You know, stuff like that. It sounds pretty basic, but a lot of people need to hear it. Tim Mullooly: Yeah. I mean, stuff like that, little things go a long way. And stuff like that can make a difference and potentially make you more money when you’re working. So, I like that the four parts are broken down into some tactical things like you’re saying in the second part, with having percentage terms to break it down. And, then, in the beginning, determining if it’s right for you or not, more on a philosophical level. So, it has, kind of, tactical and then also, philosophical balance to it for the readers. The investments and the details of people’s plans are obviously very important, but how important do you think understanding yourself and having self-awareness about your needs and goals, do you think that’s just as important as having the right investments? Randy Thurman: Absolutely. The behavioral aspects, I think, are what you’re asking. And, there’s a lot of books written just on the behavioral aspects. One of which is, Why Smart People Make Big Money Mistakes by Belsky, and is just a great read. A lot of people, when the market goes down, they panic. They get fearful. They take it out, go into money markets. Well, when do they feel better? It’s when the market’s back up. Well, they’ve just locked in their loss. Study after study after study shows the behavioral aspects are just as much, if not more so, important, in terms of the tactical aspects of how you do it. Emotions get to people. It’s a funny thing about investing, we go to store, we want to buy things on sale, but we don’t want to do that on investing. Tim Mullooly: Yeah. We sometimes, we say to clients here, that the stock market is the only industry where things go on sale and everyone runs for the door. Randy Thurman: Our philosophy is long-term investing and discipline and strategies and diversification. Spreading it around. And, that’s kind of boring. It’s kind of boring. People like boring on the downside, but they don’t on the upside. So, it works both ways. Tim Mullooly: Right. People always want all the upside, with none of the downside. It doesn’t work that way. Randy Thurman: No. And, it’s only volatile on the downside too. It’s never volatile on the upside, I’ve noticed. Tim Mullooly: Right. Chapter nine in the book is titled, Dollar Cost Averaging: The Next Best Thing to God Telling You When to Buy. I got a good chuckle out of that. Do you want to tell the listeners what you mean by that? And why you think dollar cost averaging is so important? 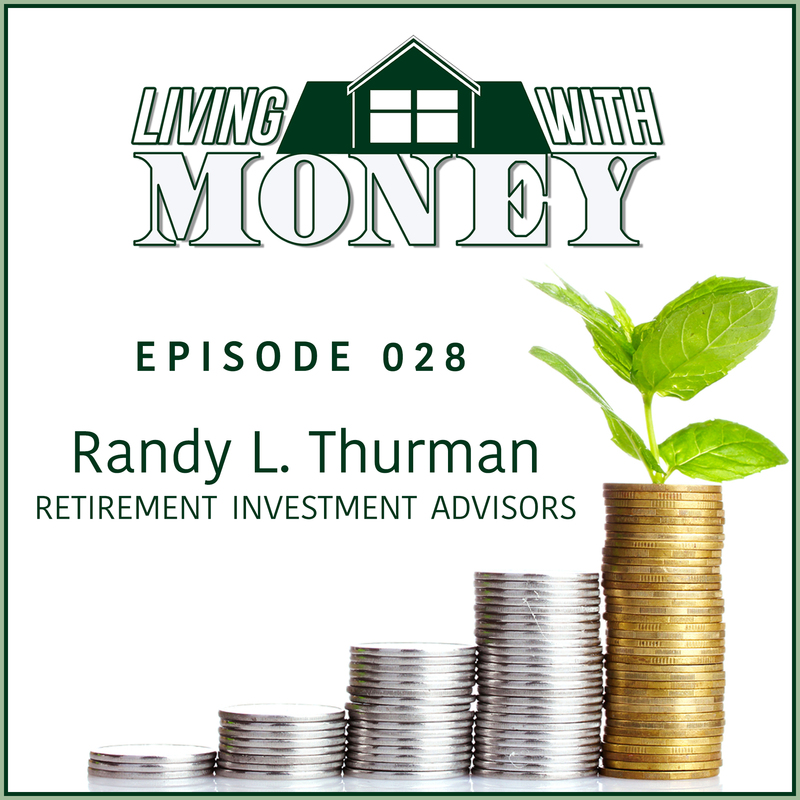 Randy Thurman: When you’re in the accumulation stage and you’re investing. You’re investing, let’s say, on a monthly basis, a 401K, whatever, IRA. And the market fluctuated. It goes up and down. And when it goes down, you’re buying a lot of shares cheaply. And when it goes up, you buy fewer shares. In the example in the book, I talk about an investment that goes from $10 to $12, $14, $16, $18, $20. And another one that goes from $10 to $7 to $5 to $1, stays at $1, then goes to $4. You make more money in the second investment through dollar cost average because you’re investing all those periods of time. And when it goes down, you buy all those shares. When it comes back, you look like a genius. So, it’s one of those few things that you can do that really allows you to maximize the probabilities that you’re going to be doing well over time. Tim Mullooly: And like you were alluding to earlier, people take their money out of the market and then they don’t get back in until it’s too late. So, that just says, timing the market is very difficult. So, dollar cost averaging is a great way to, kind of, admit that timing the market is really hard to do. Right? Randy Thurman: In my opinion, timing the market is impossible to do. We have a lot of people, what they want to do is get in at the bottom and out of the top. And, I don’t know about you, but I’ve not seen anybody been able to do it and do it well. And were certainly not the first. Tim Mullooly: Right. Like you’re saying, I haven’t seen many people be able to do that. Or, anybody, on a consistent basis. Some people might get lucky and time it correctly, but being able to repeat that process is very hard to do. Randy Thurman: Yeah. And you hear about that one time they were right. It’s kind of like the people that come back from Vegas, have you ever noticed they either break even or make money? They never lose money. But, I’ve got to tell you, Vegas is building a lot of buildings, so. Tim Mullooly: Yeah. They’re getting a lot of money somehow, over there. You’re right, you know, you never hear about the times people lost their shirt out in Vegas. Tim Mullooly: Lost their money. The last chapter of the book talks about 18 different traits of the wealth and the happy. Again, without giving too much away, what would you say are a couple of the more important, or most important of the 18 different traits that you outline? Randy Thurman: There’s probably four or five that are extremely critical and the rest are important. Some of the critical ones, the wealthy tend to think in terms of longer time frames. They look at chunks of time of five and 10 years, or generations, even, in some cases. So, they look in terms of those longer time frames. And they ask their selves the question, what do I need to do today, to get to where I want to be in five or 10 years? And they do those things. So, timeframes would be one. The wealthy tend to save first and spend what’s left over. Those that make money and aren’t wealthy, tend to spend first and save what’s left over. That’s just not a good plan. But, we see the difference there a lot. The wealthy tend to re-frame, what a lot of us would call, failure. They don’t see failure, so much as failure, but as a learning experience. And, as something to learn from and go forward towards your goals. Maybe a hurdle that they have to overcome to get to their goals. But, make no mistake, they had the discipline, which would be another critical thing. And the plan and the goal and they stick with it. I mean, they are disciplined people. That’s probably the number one trait you’ll find. Tim Mullooly: Like you’re saying, just having the discipline to stick to a plan, whether it’s dollar cost averaging or some other type of investing plan. Or, sticking with your financial plan. I would have to agree. You know, staying disciplined is probably the most important trait that someone could have. Randy Thurman: Having a good plan and having the discipline to stick with it. You certainly need to have a good plan. The discipline is absolutely critical. Tim Mullooly: Right. Exactly. The plan’s not going to mean much if you have the … You could have the best plan in the world, but if you don’t have the discipline to stick with it, it’s not going to work out for you. Tim Mullooly: So, this book, More Than a Millionaire, is not your first book. This is actually the fourth book that you’ve written. Next most recent book, The All-Weather Retirement Portfolio, came out in 2015. Can you talk about that book for a little bit? And how it differs from More Than a Millionaire? And what readers can expect to learn from that book? Randy Thurman: Sure. I’ll just take a little quick sidebar, but my first book was called, Get Rich Slowly, but Surely! It didn’t sell very well, Tim. It didn’t at all. And, you can probably guess why? Why do you think? Tim Mullooly: Because people don’t want to get rich slowly and surely. Tim Mullooly: Everyone wants the quick fix. Randy Thurman: That’s right. You’re exactly right. If it had been, get rich quick and easy, in your spare time, with nothing down. You know. Tim Mullooly: That’d be a best seller. Randy Thurman: Exactly. So, it didn’t. But, I learned from it. I learned from the book. And, what it did and what it didn’t do. And, it was great information, but outside of my family and friends, I think I sold five copies. But the All Weather Retirement Portfolio, it’s primarily for retirees, which is what our business is geared towards. What we did was, we found the worst 40 year time frame since 1935 for those that are taking distributions. Investing for distributions is very different than investing to accumulate because you have the reverse dollar cost averaging effect. It goes down. You’re selling out. You’re selling cheap shares. It makes it very difficult. And, we designed the portfolio to weather that storm. I lay it out, all the tactical information, you can lay out in a book, on exactly how to do that. And then, I talk about how to find an advisor, because I still think the behavioral aspects are so key, that you need an advisor to coach you and keep you on track. Tim Mullooly: So, has writing these two finance books changed the way that you view … You know, your thoughts and beliefs on the world of finance? Or, how do you think about helping people with money? Because there’s a lot that goes into writing a book. And, I feel like it’s a good way to flesh out your own beliefs and your own values. So, has that writing process helped you solidify your beliefs, as well? Randy Thurman: It has helped me solidify my beliefs. But, it’s also helped me learn that I am just so … You know, I’m searching for the word, but just so, bad about communicating the importance of doing this. And communicating, for example, I think mutual fund, everyone in the world should know what that is. Or stock. Or bond. And, I need to be able to communicate that in a way that the average person can understand and be motivated to move forward. And so, it has changed my belief systems a little bit that I need to work on my communication and make it easier to understand. Tim Mullooly: Right. I feel like that’s one hurdle that people like us, advisors in the industry, struggle with, is being able to relate it to someone who’s outside the industry. Because there’s different jargon, within the industry, that seems like every day to terms to us, but is not the case for people that aren’t in the finance profession. Randy Thurman: Start over and don’t use any of the financial terms. Tim Mullooly: Yeah. English, please. Right? Tim Mullooly: That’s a good comeback to that. Tim Mullooly: Yeah. Exactly. One of your other books, the fourth book, that we haven’t touched on yet, is more about running, actually. It’s called, One More Step, The 638 Best Quotes for the Runner. Can you talk a little bit about your experience with running and putting together that book? Randy Thurman: Sure. I hit 50 one year. It’s been a while back, a little ways back. But, I was over 205 pounds. I sit there and I’m like, “Am I just going to sit around and just continue to gain weight? Or, am I going to get out and do something about it?” So, I made the hairy, audacious, goal of running a marathon within 12 months. Randy Thurman: And I started running. And 11 months later, I ran my four hour marathon at Tulsa, Route 66 Marathon. And then, I have the quotes. But, I would put quotes, to motivate me, every single day, on my mirror. And read them and think about them. To give anything less than your best is to sacrifice the gift, by Premontane. Things like that. So, it’s just a little bit of a motivation book, quote book, running quote book. It was fun. Tim Mullooly: That’s awesome. I feel like certain similarities could, possibly, be tied between quotes about motivating yourself to run and staying on course and staying on track, could also tie over to the investing, finance world. Have you found any similarities? Or quotes that are in the running book, that could also apply to investors, as well? Randy Thurman: It’s extremely similar. The health of running and finance, they’re so interrelated, in terms of, because it’s a marathon. Right? Randy Thurman: It’s not a hundred yard dash. Or a hundred meter dash, now. It’s a long term thing. Tim Mullooly: You’ve got to do it. Tim Mullooly: Exactly. I feel like there’s a lot of benefits to starting early and, just, getting yourself to do it. And that’s advice that we give clients all the time. Start early. Just get out there and do it. Even if saving, like you were saying, saving 25 bucks, 50 bucks. Every little bit helps. Same thing with exercise. That’s great. Randy Thurman: It’s a start. Getting started is the hardest part. The $25 a month, if you start with that, if you’re young and you start with that, and you do half your raises, that’s the other part. If you do half the raises, you get a 6% raise, put 3% of it in the 401K. That adds up over time. So, it’s just having that philosophy. Tim Mullooly: So, having written these four books, on a personal level, what has been the most rewarding part about going through the writing process and the publishing process? And all the back and forth with your editors? What would you say has been the most rewarding part of all of these books for you? Randy Thurman: How cool is that? Randy Thurman: I mean, like you were speaking to my soul. Because I talk about the philosophies and the challenges people have with the concept of money and wealth. And, that’s pretty cool. Tim Mullooly: Yeah. When you can make a personal connection with someone reading the book, it, kind of, makes it all worth it. Right? Randy Thurman: They say, it’s like you were speaking to me, one on one. Just right there, talking to me. And, I thought that was pretty neat. Tim Mullooly: That’s how you know the message is really getting across and sinking in for the readers. So, that’s really great. You know, we’ve talked about all four of your books, now. This last one, More Than a Millionaire, was just released in February of this year. But, is there anything else on the horizon for you, coming soon? Any more books already cooking up in your head? Randy Thurman: I’ve got a full one at my editor’s desk right now, she’s beating me up over. And it’s about the step-by-step process of finding a trusted retirement advisor. It goes through all the questions that people should ask before they … The 12 questions you should ask an advisor before you hire one. But, people don’t know enough to do so. For example, are you a fiduciary? I think that should be a question people should ask. Are you a fiduciary on all accounts? As I think you’re aware, most advisors aren’t. Tim Mullooly: Totally agree there. So many questions that people need to ask before they choose an advisor. And they just don’t. Sometimes we, when we’re sitting down with a perspective client, we end up telling them what questions they should ask. You’re trusting these people with your financial lives, there should be a pretty serious vetting process when choosing them. Randy Thurman: I think so too. Just like the other though, they don’t know enough to ask the right questions. Now, they may be very, very smart people, obviously, but not in the area of finance. Randy Thurman: Or hiring a financial planner. So, I boil it down to the 12 or 13 questions that you must ask an advisor before you hire one. The other book that I’m working on right now because that one’s finished and at the editor’s, is 101 Tax Strategies for Those over 50. Yeah, that’s a fun one. Tim Mullooly: With the tax changes this year, you know, that’s definitely going to be a useful book for a lot of people. Randy Thurman: I think so. I think so. So, we’re working on that. But, my problem, a lot of times, people say, “Well, how do you come up with things to write about?” That’s not my problem. My problem is, how do I focus and work on just one? Because I’d like to write, the 21 suggestions for a long and happy life to my son, you know, that type of thing. Randy Thurman: And, I’ve already got the outline for it. But, I have to focus or I won’t get anything done. Tim Mullooly: Right. Exactly. There are so many topics that it’s hard to just sit down and focus on just one at a time. Well, that’s great. I’m looking forward to as many books as possible coming out from you. We have one more question for you. Tim Mullooly: If you had to boil it down, over the entire span of your career, what would you say is the one, best, piece of advice, that you’ve ever gotten? Tim Mullooly: Right. Well, that’s a pretty good piece of advice. Randy Thurman: Every day’s a good day. Tim Mullooly: Whether you make it a good day or not. Randy Thurman: And it is a choice. It is a choice. If you’ve ever had a chance to read, Man’s Search for Meaning by Viktor Frankl, that’s a life changing book. Tim Mullooly: I have not read that book. But, I will definitely have to check it out. That was, actually, all of the questions that I had for you today, Randy. So, I just wanted to say thank you, again, for coming on the podcast. I really appreciate you taking the time to answer some of the questions about your books. Randy Thurman: Fantastic. I enjoyed it. Tim Mullooly: For listeners out there, I will link in the show notes, to all of Randy’s books that we talked about. More Than a Millionaire, and all the other books. So, if you want to pick up a copy of any of them, feel free to look at the show notes on our website. That’s going to do it for this episode of Living with Money. Thanks for listening. And, we’ll see you on the next one.